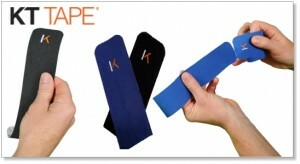 KT Tape could be called the most consumer-friendly brand of kinesiology tape. It comes neatly packaged in rolls of tear-off precut strips, eliminating the need for scissors and cutting for most applications. In addition, the company has created a vast library of both printable application instructions and instructional videos for a wide variety of injuries. This makes KT Tape Precut Strips the ideal kinesiology tape for those who don’t have access to trainers or therapists to apply their tape. Although taping yourself may seem daunting at first, an important piece of advice the company offers is not to be afraid to “jump in and just go for it.” Although there is a bit of a learning curve, the KT Tape advisors say that after three or four tries, most beginners will be taping just like the pros. 1. Before starting, ensure that the skin is clean and dry. For best results, clean the skin with rubbing alcohol or hand sanitizer to give the adhesive a good contact. Clip excessive body hair close to the skin. 2. Rounded corners help prevent tape ends from curling or lifting away from the skin. KT Tape Precut Strips come with rounded corners, but if you do any cutting yourself, be sure to round every corner. 2. For taping over joints such as knees and elbows, place the joint in its maximum bent position before applying tape. By putting the body part in a position of maximum stretch, this prevents the tape from overstretching later and loosening the adhesive. 3. Make sure the final inch at both ends of the tape are applied with absolutely no stretch so the ends won’t lift up or curl. 4. Briskly rub the KT Tape after application to activate the adhesive and make sure all edges adhere to the skin. Want to see the rules in action? Tune into “Getting Your KT Tape to Stick – Part 2” for a great video that shows everything you need to know.